Alan Partridge (Steve Coogan) is a music presenter or “disc jockey” in a north Norfolk radio station. He plays the character from his hit TV comedy series I’m Alan Partridge. Colm Meany plays an embittered DJ who has been sacked and he feels that the radio station has lost out to corporate suits. 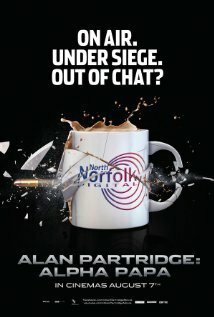 Meany holds the station hostage with his shot gun, Partridge must go in and mediate. Partridge only has to be himself and the results are disastrous. I’m Alan Partridge works as a comedy of observation. Partridge is a small town social climber trying to be sophisticated, he only reveals his own pathetic lack of self awareness. His jokes are leaden and mistimed, his dress sense is eccentric and tasteless, his appearance is that of a lower middle class ‘Wally’, (a British term for a socially inadequate person). He is a sort of latter day Malvolio, someone who sets himself up without meaning to. His anxieties are social class driven and he inhabits the world so ably satirized by the comedian Victoria Wood. He is not clever enough to be effectively nasty but he is sordidly venal: he will stab a colleague in the back in order to derive some imagined advantage from doing so. He is status anxious without being able to advance his prospects. He crawls to his boss, and is cruel to those he cannot exploit to his own advantage. We laugh at but never with him. The details of this provincialism are microscopically observed to the point of cruelty. It’s like poison poured on the film’s nerves, we can hear the acid crackle. I think that Steve Coogan does a better job of this than Ricky Gervais in The Office. Gervais wants to be cool, never can be, and is easily wounded but Partridge blunders on in his Pooterish way, leaving faux pas all over the place. He isn’t even comparable with fantasists like Billy Liar who at least has the imagination to take life vicariously. The problem for Coogan is being compared to his creation Alan Partridge. One hopes he is secure enough to keep his critically observant distance. It’s very funny.